EASTON, Pa., April 4, 2019 /PRNewswire/ -- Today Victaulic celebrates a century of innovation - 100 years since it was granted its first industry patent for mechanical pipe joining solutions. On its Centennial "Innoversary," the company continues to develop and patent groundbreaking technologies, with a current portfolio of more than 2,000 patented solutions that transform the building and industrial construction industries, while driving new industry standards in performance and safety. On this day in 1919, Lieutenant Ernest Tribe filed the first patent for The Victory Joint, the first mechanical bolted coupling to join grooved pipe ends. Now known as the Victaulic coupling, the invention enabled critical piping infrastructure to be installed more quickly, safely and cost effectively than traditional methods. While first devised for military applications, the coupling went on to revolutionize the construction industry. "For 100 years, Victaulic's reputation has been built on customer collaboration, delivering new technologies that enable productivity, and reducing risk across the construction lifecycle," said Victaulic's Chairman, President & CEO John F. Malloy. "Our Centennial 'Innoversary' is not only an opportunity to look back on our achievements, it's also great motivation to make our next century even more valuable for our customers and rewarding for our employees." Today, one billion Victaulic solutions have been installed worldwide in some of the world's most important, iconic and ground-breaking construction projects, including the Hoover Dam, Eiffel Tower, Beijing Olympic Stadium, Petronas Towers and Hudson Yards. The company's 4,000 employees are spread among 37 branches, 13 manufacturing facilities and five foundries around the world. They proudly serve customers in 120 countries with a variety of application solutions across diverse industries, such as commercial buildings, oil, gas and chemical facilities, power generation facilities, mining operations, and municipal and clean water operations. 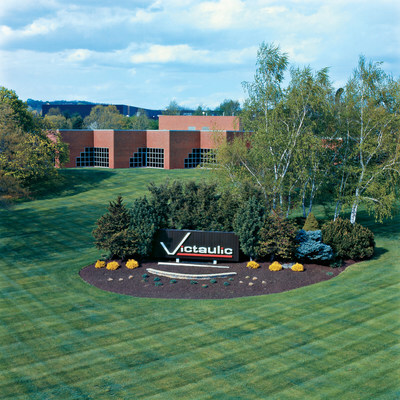 Victaulic has been part of Pennsylvania'sLehigh Valley business community for almost 40 years, having first been headquartered in New York City. Victaulic's "Innoversary" coincides with current global expansions and investments that will add close to one million square feet to Victaulic's manufacturing operations, expanding manufacturing capacity to serve customers around the globe. Set to open in 2020, the new, state-of-the-art manufacturing center in Lehigh Valley, Pennsylvania, a 400,000 square-foot facility, is the result of increased domestic demand for the company's products and the company's desire to manufacture its products in close proximity to its customers. Additional global expansions include the company's facilities in Dalian, China; Drezdenko, Poland; and Ontario, Canada. "Our next 100 years will include more customer-centric innovation as technology grows more rapidly than ever before and we continue to make strategic R&D investments," said John Malloy. "Our company is an exceptional place to work because of the dedication of our employees and a shared passion for customer excellence across the entire global Victaulic family." As a nod to its one billion installed solutions, Victaulic invites its social media followers to see, snap and share their personal findings of products on their social media channels using the hashtag #iSpyVic. Images identified with a geotag or location may be added to the company's "Mapping Success" section of its celebratory 100 Years of Innovation website. Since 1919, Victaulic's pipe joining and flow control solutions have optimized construction productivity and reduced risk, ensuring projects are completed safely, on time and within budget. Driven by a spirit of continuous innovation, Victaulic's portfolio of 100,000+ products and patented technologies promote freedom of design, as well as simplified inspection and maintenance for the life of any system. With more than 4,000 employees and 55 international facilities, Victaulic helps customers in more than 120 countries succeed in the global construction industry. From the tallest buildings to the deepest mines, customers trust our products to increase overall system durability in the most demanding construction projects and operating conditions. Learn more about how our innovative piping products and design services can engineer confidence into your build at www.victaulic.com. To access Victaulic's history fact sheet and multimedia image gallery, click here.